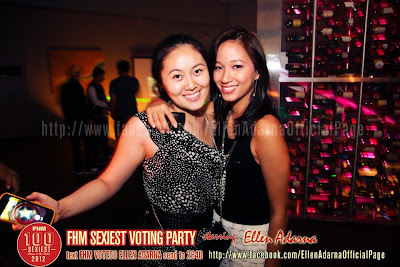 Ellen Adarna held a voting party at Fiamma Bar to push for the top spot of the FHM 100 Sexiest Women of the World 2012. Recent polls have placed her on the 5th spot, a huge jump from her debut on last year's list at No. 10. The party brought in the first 300 of the countless fans who flocked to Fiamma. Guests were treated to an open bar, a chance to play exciting games with Ellen, and a vote bidding session for 2 FHM VIP passes for the FHM Victory Party in July. The huge success was not a surprise because for 2 consecutive years now, Ellen still holds the record number of attendees at an FHM autograph signing. Ellen Adarna is the “Internet Celebrity” that officially broke into the showbiz scene in 2010. Since signing with GMA-7, she has had numerous TV and film appearances, including Captain Barbell, Si Agimat at si Enteng Kabisote, Survivor: Celebrity Doubles Showdown, and Bubble Gang. These efforts have proved fruitful, as the public grew to love the free-spirited Cebuana. Aside from these, Ellen holds endorsement deals with Asia Brewery and Posh Nails. Most recently, she has added the Belo Medical Group in her string of endorsements. This has greatly increased Ellen’s visibility with her huge billboards seen on major highways. Ellen's fans can still continue to vote by texting FHM VOTE50 Ellen Adarna to 2640.